We admit it – we love cats. Our family loves cats and I love cats. This page is going to be about cats and cat art. 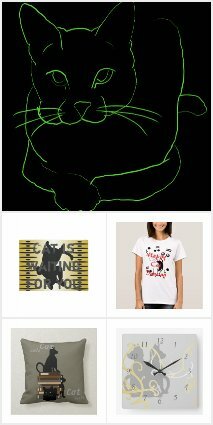 At different times, I’ve created some pretty art of cats and over on Zazzle, I’ve created some fun art products with cats as the theme of the designs. At home, we now have one cat. His name is Catamus Maximus. He was rescued by a lady from the area around the Big Chicken in Marietta, GA about ten miles from where we live now. Catamus Maximus is a long-haired cat, mostly black and fluffy but with white socks on his feet and a scruff of white fur from his chin to his belly. He pretends that he likes his belly scratched but as a tease, because he really is making an invitation to play and would rather have behind his ears and his neck petted anyway. We haven’t had Maximus Catamus for very long but he is already a part of our family and is learning to make friends with our dog, Buster B. Dog. They are starting to have fun together playing chase through the house plants we brought in for the winter. Catamus thinks those plants in the den by the fireplace are his personal forest and each day, Buster goes a little farther into the area on cat’s dare to come get him. Catamus Maximus perched where he can smugly taunt Buster B. Dog from the houseplant forest in the den. He thinks that is his personal forest / jungle and loves napping in the planters. Of course, Maximus is the cat on a perched planter high above dog, but he seems to really be enjoying the game with the dog now, often jumping to a lower plant just long enough to get Buster to come a little closer, then jumping back up to the top shelves and smirking as the dog gets hollered at to leave him alone. When Catamus Maximus came to us a couple months ago, he was mostly not putting up with Buster, even though Buster has always seemed more cat-like than dog-like. The cat wasn’t buying it – not scared, but not putting up with that durn dog either. Now, they chase each other around the kitchen farm table that sits in the middle of the kitchen like an island and try to sneak up on each other. Cat definitely fends for himself but he is being a lot more playful about it and will chase the blanket that Buster is dragging around to sit on in the kitchen floor. Our cat, Maximus Catamus and Buster B. Dog in a standoff after chasing each other around the farm table in the middle of the kitchen. Over the years, we’ve had lots of different cats and some of the stories about them will be written on this page of my blog. I’m also going to show some of the cat art that I’ve done and products I’ve made for cat lovers, along with information and videos about cats that we’d like to share. Already, Catamus Maximus is a member of our family and we are glad he is here instead of running around by the Big Chicken where someone left him. He is snuggly and has way too much personality to be a cat, but don’t tell him that. We love him lots. Well, I thought this page acted more like the blog to post something every so often. It is set up as one post instead, so it will be updated as I go with bits of cat stuff added here, I suppose. Gangsta cat belongs to my friend in New York and loves to roll on the carpet upside down. I made this poster of him last year. He is too funny. A fun cat poster that I made on Zazzle – very sparkly.